Opening night of Hawthorne’s summer harness racing starts up in just one week and a look at the first condition sheet indicates the early portion of the meet will put the emphasis on the Late Closer Series. Four of the eight opening legs of Late Closer Series events will be raced on the first Friday’s first card—the $8,500 Walter Paisley and the $8,000 Dave Magee filly paces and the $8,500 Bea Farber and $8,000 the Daryl Busse for trots. The $8,500 Bob Larry for colts and geldings and the $8,000 Mike Paradise for strictly ICF male pacers will get under way on the Saturday May 5th program, while the first round of the $8,000 Tony Salvaro for pacing fillies and the $8,000 Phil Georgeff colts and geldings are expected to head-up the first Sunday card. 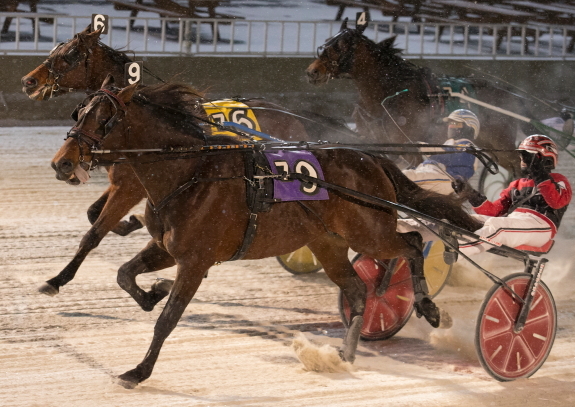 The nomination list of 3-year-old ICF pacers and trotters currently eligible for the upcoming summer stake series leading up to the Night of Champions has been released by Hawthorne’s Race Secretary Robin Schadt. Heading the nom’s list of 39 state-bred colt or gelding pacers for the Robert Carey Memorial Series is last season’s Illinois Horse of the Year Fox Valley Gemini ($157,970). The Terry Leonard trainee was a perfect nine-for-nine with driver Casey Leonard on his way to dominating the ICF freshmen division capped by a victory in the $195,000 Incredible Finale Championship for Atwater, Illinois owner Jim Ballinger. The Plum Peachy for ICF 3-year-old filly pacers has 34 nominees, including the 2017 Illinois 2-Year-Old Filly Pacer of the Year Fox Valley Jazzy, owned by Cathy Finn-Kanitz and trained by Dale Kanitz of Olney, Illinois. The $175,000 Incredible Tillie champion finished her first campaign with four consecutive victories and earnings of $130,365. Other notable Plum Peachy eligible fillies include: Violet titleholder Rollin Coal, from the barn of Hosea Williams and the Rodney Freese owned and trained pacer Fox Valley Catwalk, currently riding a five-race winning streak as a 3-year-old after sweeping the Doc Walker Late Closer Series at the Hawthorne winter meeting. As far as ICF sophomore trotters, 19 fillies were submitted to compete in the Beulah Dygert Memorial Series, while 22 colts and geldings have been designated as eligible to race in the Erwin F. Dygert Memorial series. The 2017 Fox Valley Flan Night of Champions victor, Good Design (Kyle Wilfong) is Beulah Dygert, bound for trainer Brett Wilfong and owner Mr. Lynn Wilfong. 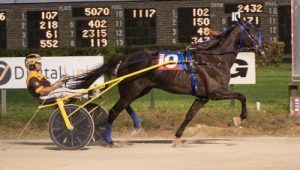 The Illinois freshman filly trotting champion won half of her 10 starts in 2017 and earned $94,187. The Mike Brink Stable’s Maui Mama ($81.280), the Violet freshman victor with a gaudy record of 7 wins in 9 starts, and Trotting Grace, ($64,782), a five-time winner in 2017 for trainer Steve Searle, are also Beulah Dygert stake series eligible. This summer’s Erwin Dygert stake series should be a dandy with the likes of Illinimight, Vic’s Pizza, True Detective, and Cruzin Cassi, all returning as 3-year-olds after strong first season campaigns. Illinimight ($84,330), a Mike Brink trainee, won his last four 2017 starts including Hawthorne’s $115,000 Kadabra Final on the Night of Champions. 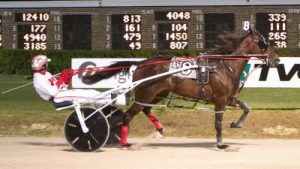 Vic’s Pizza ($53,455), was named the 2017 Illinois 2-Year-Old Colt Trotter of the Year, despite being sidelined in early September. The Brink stable-mate of Illinimight won both the Springfield and Du Quoin State Fair championships before his season-ending injury in the September 9th leg of the Kadabra series. The Curt Grummel trained True Detective ($37,195), captured the Cardinal Final and two series divisions of the Kadabra, while Cruzen Cassi ($59,256), from the John D Finn Stable, was third or better in 10 of 12 freshman starts and the runner-up in the Kadabra showdown. A complete list of the summer’s ICF 3-year-old stake nominees can be found on the Hawthorne web-site. Click on the “Horsemen” category. Last Saturday’s Springfield Spring Review, saw Hawthorne’s three-time defending driver champion Casey Leonard bring home 6 of his 15 drives on the 21 race card and they all came in the last 11 events. Casey also had a pair of second place horses and a trio of third place finishers. Three trainers—Tom Simmons, Curt Grummel and Roshun Trigg—sent out three winners on the Springfield card. Jamaica Patton had a driving triple. The fastest winner was a 1:54.3 clocking, by the Jamaica Patton trained 4-year-old colt Fox Valley Reggie, who uncorked a 26.3 final panel in his first start since mid-February. The Bob Walker 5-year-old trainee Bucklegirl Bobette, was a romping 13 and one-half length victor in her division, with a 1:54.4 mile on the front-end, pacing the last half in :54.4 with a 27 flat final quarter. All horses must have a current negative coggins test (within one year) and a current EHV (rhino) vaccination (within 180 days) on file in the racing office which must be dated and signed by the veterinarian. Additionally, all horses originating from out of state must present a valid health certificate dated within 10 days of entry with the horse’s temperature recorded on the certificate. The Illinois Comptroller’s office notified the Illinois Association of Agricultural Fairs recently that the money for the premium fairs for their reimbursements was being released. Although this is not an issue specific to Illinois horse racing, we understand that many horsemen are also actively involved with their county fairs and would appreciate the good news. Good job to all involved in making this happen. All horses wishing to enter into races at Hawthorne must have a current EHV-1 vaccination on file prior to entry. This paperwork will not be collected at the stable gate, but instead must be on file in the racing office. The verification of EHV-1 vaccination will be confirmed by racing office staff for every entry. The direct fax line to the racing office is 708-780-3757. The stall applications are being finalizing and the barn list will be posted on Monday, April 23rd on the Hawthorne website. Move in date onto the backstretch will be Wednesday, May 2nd, with the first possible day for training of Thursday, May 3rd. The first qualifiers will take place on the afternoon of Saturday, May 5th. With opening night of Hawthorne’s summer harness racing meet two weeks away Saturday’s Spring Review at the Springfield State Fairgrounds offered Illinois circuit horsemen a chance to pick-up some purse money before that May 4th opener. It turned out to be an opportunity the majority of Hawthorne and Illinois County Fair trainers just couldn’t pass up. Saturday’s Springfield races strictly for ICF pacers and trotters age three and upward saw a much more than expected 123 horses entered enabling an abundant total of 21 races to be programmed. With $50,000 in purse money set aside by the Illinois Department of Agriculture for the Saturday April 21st program, purses for each event will be at $2,831 per race. For many of the ICF3-year-old and up horses who haven’t been in action since the end of the Hawthorne winter meet Saturday’s Springfield non-wagering races will serve as a helpful prep for the upcoming summer session on the Stickney, Illinois one mile track. Four divisions for both the ICF 3-year-old fillies (22 entries) and colts (27 entries) were warranted and they’ll go as the first eight races on Saturday’s card. Four divisions were also needed for the ICF male pacers ages four and up when 23 horses passed the entry box and will be conducted as races 13 through 16 and lured such familiar names as Cole Heat and Fox Valley Reggie in division one, Fox Valley Nemitz and Cuinthepurplerain in split two, Slezburgeslzburger, He Gone Jack, Gabe Henry and Dinky Dune in the third group and Et Tu Brute and Ricky Bobbie in the fourth. The Robert Walker Stable’s Bucklegirl Bobette, winner of Hawthorne’s $50,000 Tony Maurello Final on her way to being honored as the 2017 Illinois 4-Year-Old Filly Pacer of the Year, landed the outside seven slot in the second older mare pacing division, the 14th event. The 16th race for state-bred 3-year-old male trotters will see Hawthorne’s Night of Champions Kadabra titleholder Illinimike, from the Mike Brink Stable, take on Cardinal champion True Detective, trained by Curt Grummel. There’s only one division of the ICF 4-year-old and up filly trotters (race 19) and while it came up shorter on quantity it didn’t lack on quality with a field of Anna’s Lucky Star, the 2017 Illinois 3-Year-Old Filly Trotter of the Year, along with Fox Valley Elana, Lou’s Credit Report, Lou’s Game N Match, Lou’s Misty Blue and Fox Valley Shout. The last two events on the program, races 20 and 21 are for ICF male trotters age four and up with Primed N Powerful, Trixie’s Jethro, Totally Pazzazzed, Dr Spengler and Band’s Houdni tangling in the first split while current Erwin F. Dygert Memorial stake champion Picky Picky Valor, last season’s ICF 3-Year-Old Colt Trotter of the Year Lousciper, Coffee Toffy and Show Stopin Monkey squaring off in the second. Five seven-horse fields of qualifiers will be contested after the 21race Spring Review card is completed, bringing the number of horses entered for Saturday at Springfield to an unexpected total of 158. Hawthorne Updates: The backside at Hawthorne will be available to horsemen on Wednesday, May 2 with the track to open for training on Thursday, May 3. The first qualifying day will be Saturday (May 5) and will take place prior to the regular wagering program. Ready to Rumble: Veteran Illinois trainer Tom Simmons saw his horses finish first in 5 of the 6 qualifiers contested a week ago at Springfield including the stable’s “Big Three” consisting of classy sub 1:50 pacers Somestarsomewhere (1:55.3), Aimo Hanover (1:58.2) and Yankee Bounty (1:57.3). Each was driven by Simmons for his primary Illinois owner Clinard Properties Inc. of Mt. Sterling. The 7-year-old pacer Somestarsomewhere ($24,019) is a 23-time career winner with a mark of 1:49.2, taken as a 3-year-old at Lexington. Aimo Hanover ($232.311), a 6-year-old, has 19 lifetime victories and sped to a 1:49 flat mile last summer at the Springfield Stare Fair. Yankee Bounty ($715,097), also six, has tallied 21 wins and his fastest mile of 1:49.3 came in his sophomore campaign in Pennsylvania at The Meadows. UPDATE: The previously announced $50 entry fee will be waived for IHHA Members for the April 21 State Fair Races and qualifiers. If the trainer and the driver are IHHA members there will be no fee. Membership forms will be available onsite through Brenda or Tina in the race office. Membership to the IHHA is $40. If you choose not to join the IHHA, then you can still race but the fee to start will be $50. Thank you to Hawthorne Racecourse for sharing in the cost along with the IHHA. Races for ICF 3-year-olds and older horses will be held at the Illinois State Fairgrounds on Saturday (April 21) at 11 a.m. Estimated purse for each race is $5,000. Entries can be made by contacting LeAnn Shinn at 618.783.2589 by Wednesday (April 18) by 10 a.m. Entries can also be made online. Qualifiers will also be held after the races. There will be no entry fees for the races or the qualifiers as long as the trainer/driver are IHHA members. 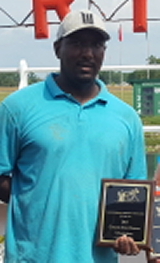 After back-to-back career best years as a trainer Mississippi native Roshun Trigg has been busy this past winter in his home state preparing for summer harness racing in Illinois. The 40-year-old Trigg has been getting his stable made up of mainly of ICF trotters ready for the opening of Hawthorne’s summer meet on Friday May 5th and the Illinois County Fair Circuit on June 5th through the 10th at Macon County in Decatur. “I’ll be leaving here soon and want to get up to Illinois for the (April 21) qualifiers at Springfield,” said Roshun from his Mississippi home where the winter weather was considerably balmier compared to the Chicago area. Trigg says it’s still too early to determine what 2-year-old Illinois-breds in his barn look like the cream of his crop but he does have high hopes on his now 3-year-old filly trotter Silver Charm who banked over $30,000 as a freshman for her owners Flacco Family Farms of Alexis, Illinois. A daughter of Lou’s Legacy, Lou’s Silver Star finished her first campaign with back-to-back victories at Springfield in Fall Classic events where she established her freshman mark of 2:00.2. For the year she had 5 wins, 4 seconds and 3 thirds in 16 starts. “Silver Star could have a good year for me. She’s coming along strong as a 3-year-old, “said Roshun. In 2016 Roshun’s win total from his barn jumped from 55 to 86. Last year his horses made 96 stops at a winner’s circle. At the same time, purse money won by his stable more than doubled as well. In 2013 through 2015 money won by Trigg’s stable averaged a little over $115,000. The last two years that number shot up to $301,069 in 2016 and rose to $356,879 in 2017. Heading up Trigg’s Stable last year were the Illinois bred trotters Louscipher and Lou’s Credit Report, now 4-year-olds. Louscipher was named the 2017 Illinois 3-Year-Old Colt Trotter of the Year after a 10-victory campaign that included the $50,000 Springfield championship, the $29,000 Pronto Don at Du Quoin, and two $16,000 legs of Hawthorne’s Erwin S. Dygert Memorial stake series, amassing over $92,000 in purse earnings Illinois owners Flacco Family Farms (Alexis) and Dr. Patrick Graham (Pittsfield). A winner of 19 career starts in 40 trips postward. Louscipher raced out of the barn of trainer Ronnie Gillespie during Hawthorne’s winter meet mostly in Open Trots as did Lou’s Credit Report. Both trotters went 2-for-6 at the meet. Lou’s Credit Report made six winner circle stops in 21 tries in his sophomore campaign when she banked $70,655 for the Flacco Family Farms. The filly was the 2017 runner-up in Hawthorne’s Violet Final and Du Quoin’s Windy Skeeter. She also competed in Opens at the winter meet. Roshun’s specialty through the years has been developing young ICF trotters and bringing them up to Illinois to compete. In fact, his very first winning horse as a trainer back in 1999 was a freshman filly trotter named Giraffe Girl who won her Shawnee stake elimination at Du Quoin with Tom D. Tetrick at her lines. To enter, horsemen can contact LeAnn Shinn at 618-783-2589 by Wednesday or they can be made online. For more information contact Tina Schrock at 217-416-0006. When Hawthorne opens its summer harness racing meet on May 6th plenty of handicappers will become fixated on its 1,320 feet homestretch, currently the longest of any racetrack in North America with an extended pari-mutuel meeting. Many of us like to see a winning horse come from far out of it and mow down a field in time. Passing up half-dozen horses or more in the lane before the finish wire is an exhilarating way to cash a winning ticket. However, it turns out coming from seventh or farther behind at the half and finishing first at Hawthorne’s winter meet was an uncommon occurrence. It came about as frequently has a horse winning from Maywood Park’s dreaded 8-hole did, which wasn’t very often. Of the 255 races contested at the winter meet only 20 winners were seventh, eighth, ninth or tenth at the half-mile pole. That’s a winning percentage of only 7.8. The vast majorities of horses (52.5 per cent), were either on the lead or in second place at the half and went on to win. That success drops down to 23.9 per cent for winning horses who were third or fourth half-way through a race. That figure dips down to 15.6 per cent for winning horses coming from fifth or sixth at the half. Only 60 winners or 23.4 per cent of the winter meet’s winners came from fifth or farther back at the mid-way mark. In comparison, more than three-quarters (76.4%), of the 255 winning horses were in the first four positions after the first half of a race. A lot of things have to go right for a horse to rally past six or more other horses in the last half mile, such as live cover rather than bad cover, an honest pace by others up front, a clear path in the lane, not being blocked or not shaking loose in time, along with other types of traffic problems. Of course, some horses simply lack early speed and a driver has no choice but to try and come from out of it with his pacer or trotter. Sometimes, these late chargers do rush past in time, but at this past winter’s meet those far back successful rallies, were few and far in between. Will things be much different in the summer meet? Perhaps, but are you willing to bet on it? Noms Due Soon: A reminder to horsemen that nominations are due by April 15th for Hawthorne’s ten Late Closer events, while its summer claiming series must be postmarked no later than May 1st. All series will carry an entry fee of $200. Hawthorne’s complete late closing and claiming series schedules as well as nomination forms are available at https://www.hawthorneracecourse.com. Nominations for the Night of Champions ICF two-year-old stake season are due on April 15th, at a cost of $1,250. Horsemen will also be able to supplement to these stakes for $2,250 by May 15th. Supplemental nominations for the three-year-old crop of state-bred pacers and trotters is also due on May 15th for a fee of $2,750. Aged stakes for the Night of Champions require only a $500 payment at the time of entry for their respective event. Springfield, IL — Races for ICF 3-year-olds and older horses will be held at the Illinois State Fairgrounds on Saturday (April 21) at 11 a.m.
Qualifiers will be held after the races. Entry fees for races and qualifiers will be $50. Estimated purse for each race is $5,000. Entries can be made by contacting LeAnn Shinn at 618.783.2589 by Wednesday (April 18) by 10 a.m. Entries can also be made online. Get updates from the IHHA.